Lexidyne helps clients address and answer specific questions about how a complex future is likely to unfold under various scenarios. 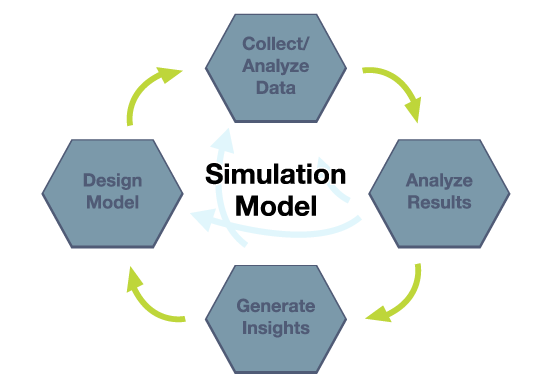 When developing simulations, we take a robust, multifaceted approach - define the issues, formulate model structure, and collect/analyze associated data. This approach provides clients with a risk-free virtualization to identify leverage points, test various strategies, and understand the return on investment. Lexidyne integrates a system dynamics conceptual framework with discrete-event and agent-based models. The system dynamics framework facilitates a common conceptualization of the structure of a system, while the discrete-event and agent-based simulation methods represent individual entities with distinct attributes and behaviors and the interaction between these entities. This approach provides a nuanced perspective on complex systems, allowing our clients to craft customized strategies tailored to specific populations rather than relying on aggregate measures.